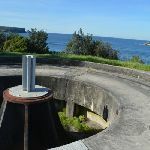 This walk guides you through the historic and well maintained outer Middle Head fortification battery. 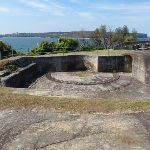 Take a step back in time, by walking along Old Fort Road past the old barracks and through the banksia forest to the open clearing and array of gun emplacements. 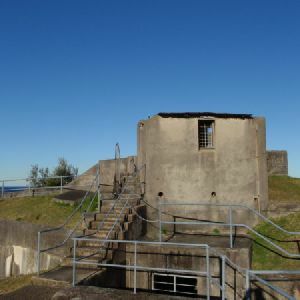 At the fortification, you can explore the tunnels, underground rooms and circular gun emplacements, enjoy the views of the sea cliffs and harbour views. Unisex flushing toilet. Entrance is 69cm wide, toilet seat 43cm high, handbasin outside is 76cm high. Room is 1.4x1m. 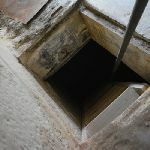 There is a 10cm step to access the building. 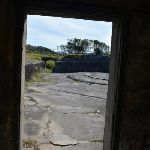 Continue straight: From beside the row of large gun timber brackets (bases), this walk heads downhill for 50m along the wide gravely trail towards the water to come the large network of concrete and sandstone forts and gun emplacements. 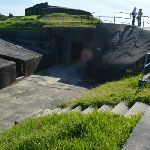 The area can be explored, taking care of cliff edges and large potential falls into the fortifications. 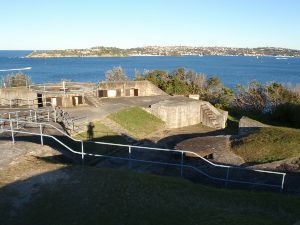 The Outer Middle Head Battery is the main complex in the Middle Head Fortifications. 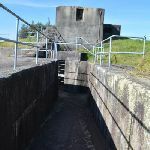 Work for building the fortifications started in 1801 and the last batteries were constructed in 1942, with the majority of the work being done 1870 and 1911 . 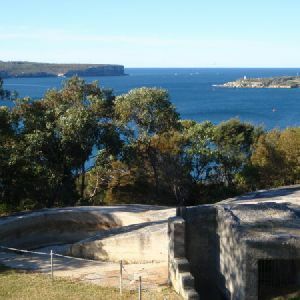 There is a network of tunnels and rooms underground that was build to support the gunning placements to protect Sydney Harbour from enemy invasion. 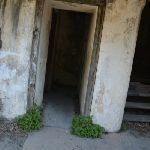 There are formal tours available or you can take care and explore the area yourself. 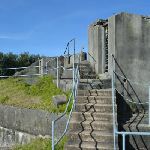 Ground is rough and slopes moderately steeply down to unfenced drop into gun emplcement and cliff edge. Significant unfenced fall risk. 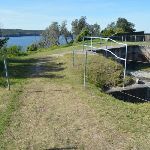 for another 15m to come beside the unfenced western forts and tall cliff. Keep two full body lengths back from cliffs and significant drops to reduce the risk of falling. At the end of this side trip, retrace your steps back to the main walk then Turn sharp right. 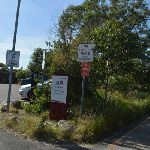 Parking: There are 0 designated accessible parking areas on this walk. 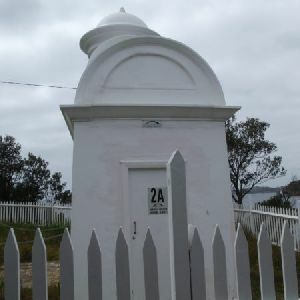 Toilets: There are 0 designated accessible toilets on this walk. Seats: There are 0 places to sit on this walk. 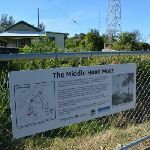 Hazards: There are 1 specific noteable accessability related hazards on this walk. Trip Hazard Ground is rough and slopes moderately steeply down to unfenced drop into gun emplcement and cliff edge. Significant unfenced fall risk. Found about 330m into the walk. 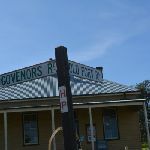 Click to see more images take nearby. 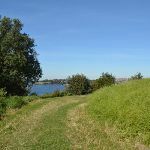 Around 270m of this walk has gentle hills with occasional steps, whilst the remaining 65m is flat with no steps. 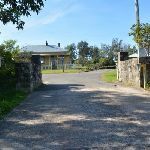 Around 270m of this walk follows a clear and well formed track or trail, whilst the remaining 65m follows a smooth and hardened path. This whole walk, 330m is clearly signposted. 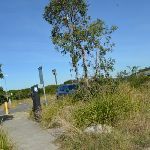 This whole walk, 330m requires no previous bushwalking experience. This whole walk, 330m is not usually affected by severe weather events (that would unexpectedly impact safety and navigation). 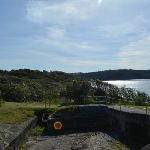 This whole walk, 330m is close to useful facilities (such as fenced cliffs and seats). 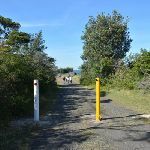 A list of walks that share part of the track with the Middle Head Battery walk walk. 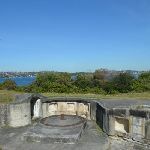 On this walk you will explore the historic northern or ‘inner’ Middle Head fortification battery. 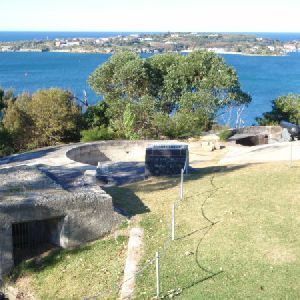 You can explore the trenches, tunnels and rooms of the fortifications on the less busy gun emplacements on Middle Head. 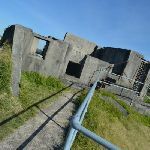 The vegetation, water, cliff and harbour views are also spectacular and well worth spending a bit of time to carefully explore and soak up the sites. 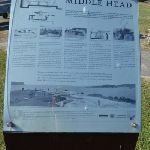 This walk leads you around the perimeter of Middle Head. 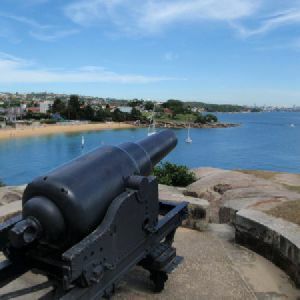 This is a great place to explore, with many forts, barracks and views over Sydney Harbour. 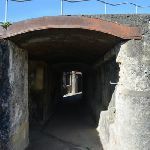 The forts area is an excellent place to spend some time walking through the tunnels and gun pits. 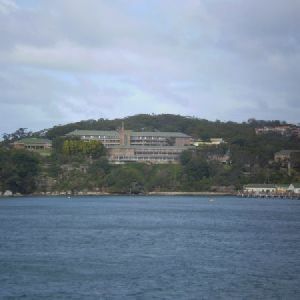 A list of walks that start near the Middle Head Battery walk walk. 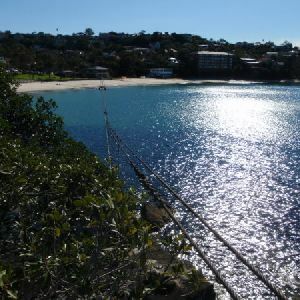 This walk guides you down a short but fairly steep trail to the beautiful Cobblers Beach. 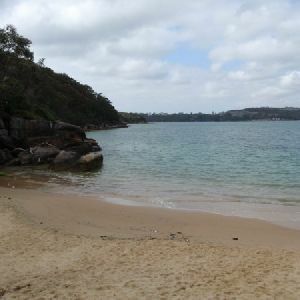 The beach is a small pretty and clothing optional beach on the northern edge of Middle Head in Sydney Harbour NP. 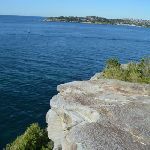 There is a grassy area above the beach if you want to picnic and the water is generally protected from the swell and the rocks on the shoreline are interesting to explore. 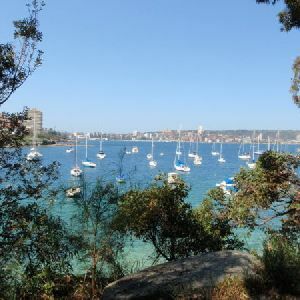 This is an excellent walk with some very scenic views. 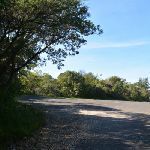 The walk travels along a well used track through the thick coastal bush. 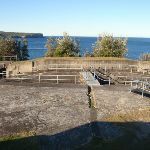 The views are capped off by the vista over Sydney Harbour from the Grotto Point Lighthouse. 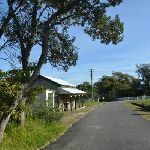 Easy parking, a few good side trips, and in particular, the Aboriginal Engravings, make this walk all the more appealing. 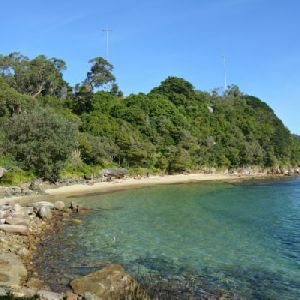 This is a short walk down to Castle Rock Beach, tucked into the rocky shores of Middle Harbour. 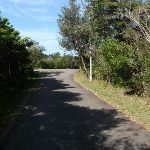 The walk is mostly along boardwalk or footpath through rainforest vegetation. 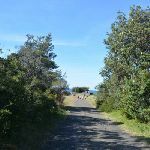 The foliage surrounding the track is topped by a closed canopy which provides shade, before opening out onto the sunny beach. 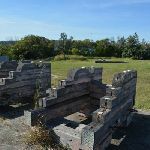 The Castle Rock to Grotto Point walk is a great way to see the Grotto Point Lighthouse. 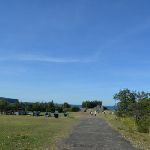 The start at Ogilvy Rd passes Castle Rock Beach, which is a nice spot to view the harbour, before continuing to the excellent view from Grotto Point Lighthouse. 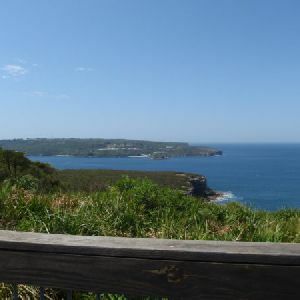 This is a great, short walk to a lookout with a fantastic views. 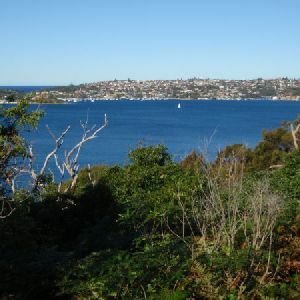 The lookout has great views out through the heads, and also much of the upper reaches of Sydney Harbour. 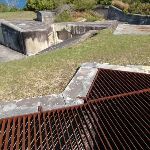 From the lookout, you can even see down into Crater Cove, to the old houses built during the great depression. 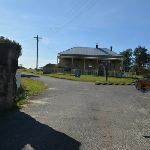 The walk is very short and starts on Dobroyd Scenic Drive. 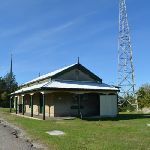 Whilst in the area, it is worth looking at Arabanoo Lookout at the north-eastern corner of Tania Park. 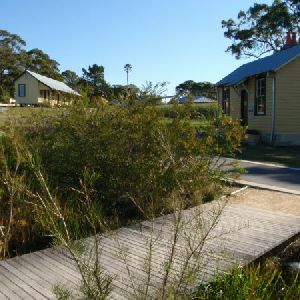 Spend some time relaxing and exploring Camp Cove – the first landing place for Europeans in Australia. 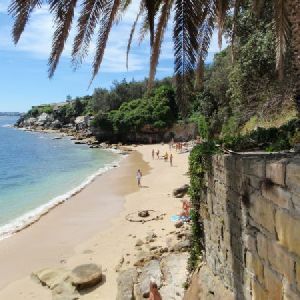 On this walk, you will head across the northern end of Camp Cove Beach, up some steps to follow an old sandstone cobbled road. 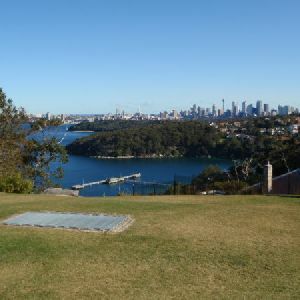 This road leads to a great vantage point, with views over the Sydney Harbour to the city. 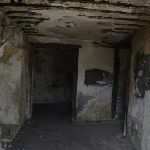 This spot is also host to a large (disused) gun, that once defended these shores. Plenty of history and beauty. 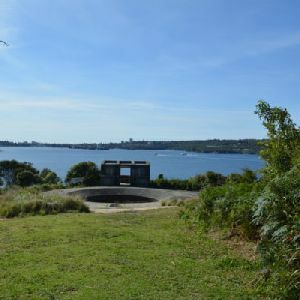 This walk leads to a popular nudist (clothing optional) beach on Sydney Harbour’s South Head. 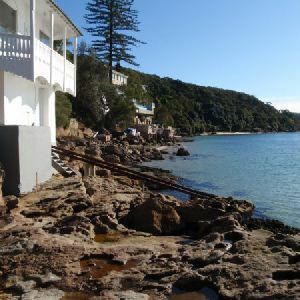 The walk follows the clear footpath / old roads past several significant historic and beautiful sites before climbing down a set of steps to find the beach. 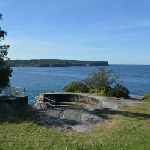 The beach is protected from the main surf on the inside of the headland and provides a great view across the harbour to Middle Head. 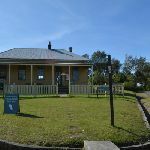 http://new.wildwalks.com/wildwalks_custom/includes/walk_fire_danger.php?walkid=nsw-shnp-mhbw Each park may have its own fire ban, this rating is only valid for today and is based on information from the RFS Please check the RFS Website for more information.